Please note this is a working farm not a tourist venue. Remember there is no right of access. The two feature introduced below are know known to be Iron-slag mounds dated by Radio-carbon dating to approx. the 2nd century AD. 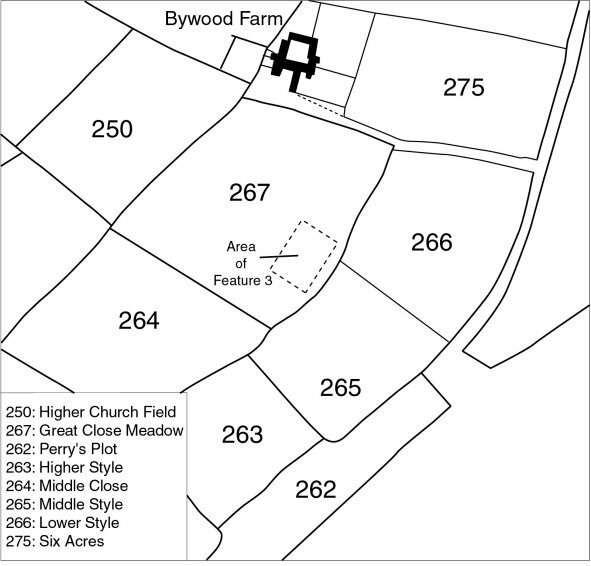 Feature 3 was discovered by whilst exploring the land holdings of Bywood farm after which the landownerdirected him to a similar mound now known as feature 4. The two mounds are similar in size and dated to approximately the same period, but situated in very different topographical locations. An opportunity to investigate feature 3 provided a limited picture of the composition of the mound. Both features provided charcoal for radiocarbon dating and offered 1st-2nd century AD dates. Feature 3 is situated (elevation 245m OD) 50m from the south-east corner of field TM 267 (fig 8). The landowner/ has always known of the feature (in field TA267) but not of its relevance nor its’ origin. 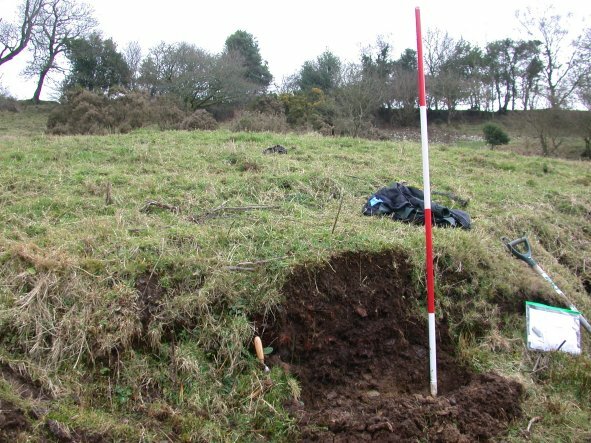 As with feature 2, which is immediatelyabove the line of spill in an easterly direction to this mound, feature 3 is situated on flat ground on the very top of the plateau 150 m south of the farmhouse itself. It is a good 300m to the head of the Cleave and a further 200m from the start of present-day Bywood Copse and the other proposed iron-working sites of feature 4, (see Weicken 2004), and of the Saxon dated site (see Griffith & Weddell 1996). Looking across at the slight rise of feature 3. 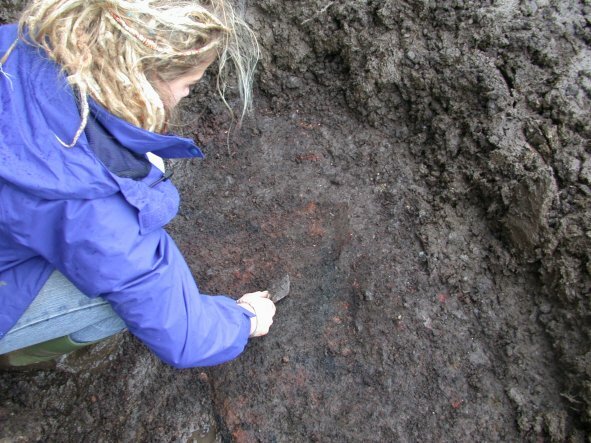 This was the first of two mounds of iron-ore slag to be discovered and recorded by the Community Landscapes Project. Volunteers recording the profile of the mound of iron-ore slag. Note this site is on almost level terrain which is in direct contrast to feature 4. Furthermore feature 5, the ditched enclosure is immediately bordering the edge of this feature on the opposite side of the hedge. The feature lies 80m to the east of the nearest metalled road, however the Tithe Map field names here i.e. TA 266, 265 and 263 are Higher, Middle and Lower Style. Perhaps these suggest there had once been a track passing through but turned now to run down the 19th century farm entrance. Beyond the road the field names (heath and furze) suggest this to have once been open moor. The nearest woodland is suggested here as Holmwood farm (‘holly wood’) 500m along the level to the west. On the other hand the plateau top may have been wooded and much of it lost to land clearance. Plan 3: 1st - 2nd Century AD Romano-British Iron-ore slag mound and possible furnace site. Julia excavating a small section of the mound to gather material for dating. 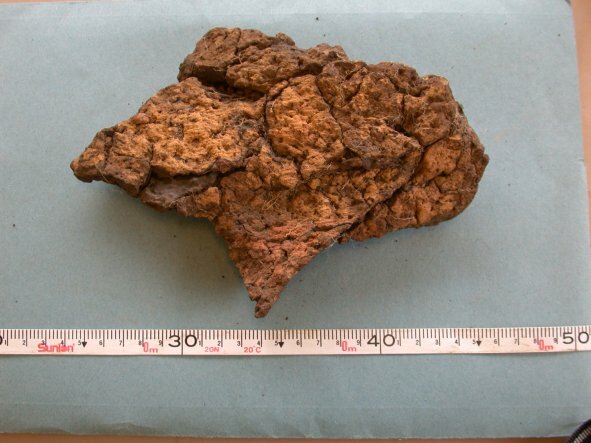 This proved highly successful and lumps of charcoaled wood radiocarbon dated to the 1st century AD. 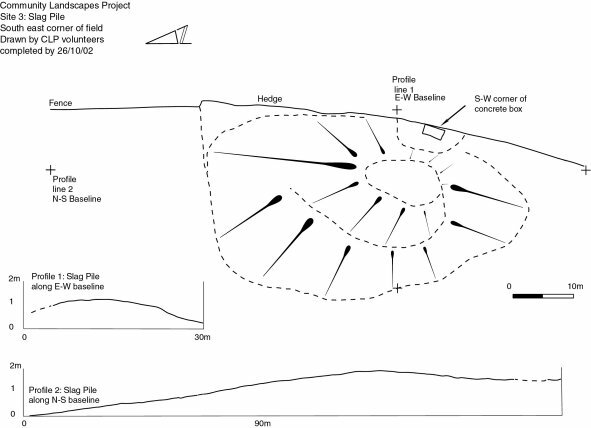 A plan of the oval-shaped mound at a scale of 1:100 was produced in October 2002 (see but revised in December 2003 after the removal of the old water-tank was completed. Feature 3 now appears as an oval-shaped mound with a levelled top, approximately 80m north to south and 30m east to west. Its highest point is probably 1.20m. The feature does not extend beyond the hedge-line out of the field but does sit close to the field’s eastern hedge line. At this point there is now a half-destroyed concrete water-tank and a new plastic tank. It should be noted the laying of pipes leading from the old tank and the replacement tank (water-pipes run toward the house and out-buildings) will have dissected the feature. Iron production produces lump of iron slag as shown above. Small pieces as above can end up miles from the production site since it is often used to infill damaged tracks etc. This second red lump is clay. It is much lighter in weight and is the remains of the furnace lining. It crumbles to pieces if moved so if you find this material in quantity then you are more likely to be at the actual iron production site. 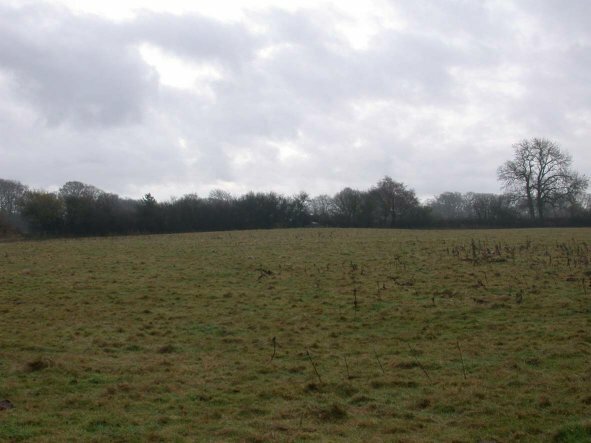 A study of the 1844 Tithe Apportionment data indicates the name of the field is ‘Great close meadow’ and simply suggests the usage was as the primary meadow. The landowner informs that the field has never been ploughed in his families’ lifetime and being Meadow probably never has been ploughed. Examination of the Sites and Monuments Register held 1940s RAF aerial photographs show the mound as possibly having once been three to four separate mounds now levelled over time into one. This led to the original impression the general shape of the feature and its position abutting the hedge implied it had been dumped from a cart. It was suggested, after dumping the material would have been spread as a phosphate on the surrounding fields. This was often carried-out in the 19th century to improve the mineral content of the fields. Other suggestions are the material was dumped and intended as mettling for a road, track, and or gateways, or as hedge building material. Nevertheless the overall findings of the keyhole investigations and subsequent radiocarbon dating undertaken in December 2003 during the removal of the water-tank provided a different proposition. Weiken concluded the mound composition was the same as in other fully excavated slag mounds and could therefore be compared. The staining of the iron salts suggested the presence of more iron-rich material on top of the mound, which had by now disappeared as a result of erosion, animal or human action. 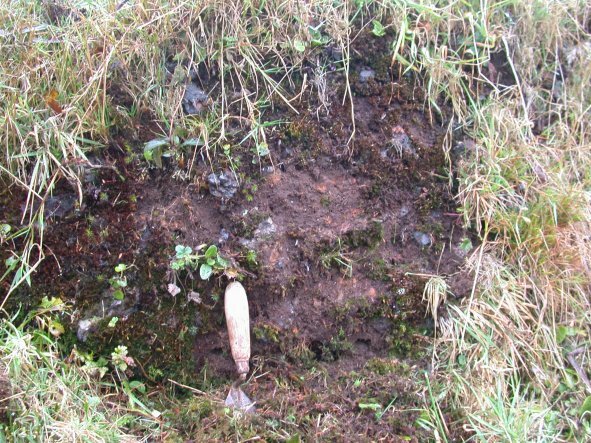 The compacted nature and clearly distinguishable layers gave the impression the material was indeed ‘insitu’ and that the mound is connected with bloomery iron-production belonging to the 1st - 2nd century AD Romano-British period. The two pieces of charcoal radiocarbon dated returned dates Cal BC 10 to Cal AD 330 and Cal AD 60 to 240. Feature 4 consists of a iron-slag mound, approx. 15m by 20m, and is situated on a steep slope 530m to the north of the upper iron-slag mound referred to as feature 3 and about 100m south-west of feature 2 (the Hill slope/D-shaped enclosure). Feature 4 however is only approx. 150m south of the 8/9th century iron-working mound discussed in Griffith & Weddell 1996. The slope is south-west facing running down to a stream at the bottom of the cleave. The slight hump is the iron-ore slag mound of feature 4. The view is looking south out of the cleave back towards the farm. View of section cut into second mound of iron-ore slag. Note the steep rise out of the cleave to the plateau top where the slope is only slight and the D-shaped enclosure of Site 2 is situated. Did the material dumped here come from Site 2 or was the furnace somewhere between the two? Here the closer view of the section cut into the side of the mound shows the iron-slag waste material as it was deposited during the Romano-British period. Along the top of the slope there appears to have been either chert quarrying (as large quantities of chert can be seen on the surface) or more likely the remnants of iron-ore extraction. There is also a derelict Linhay (elevation 211 OD) with iron-slag built into the walls. On the opposite slope to feature 4 (i.e. the western-side of the Cleave) there is a quarried/scooped-face, platform and waste mounds cut into the side of the Greensand slope. This feature lies in TA 245 and is referred to as ‘Shut Plot’. There is also an obsolete and near invisible track running south along the length of Shut Plot toward the farm itself. The mound itself is has not been planned or surveyed in detail but here is presented as approx. 15m by 20m and just less than 1m high. It has been cut by a track leading to a gateway, running along the bottom of the valley. This allowed for a cleaned section to be recorded and the composition of the mound photographed. It was also possible to collect charcoal samples large enough for radiocarbon dating from a secure context within the material. 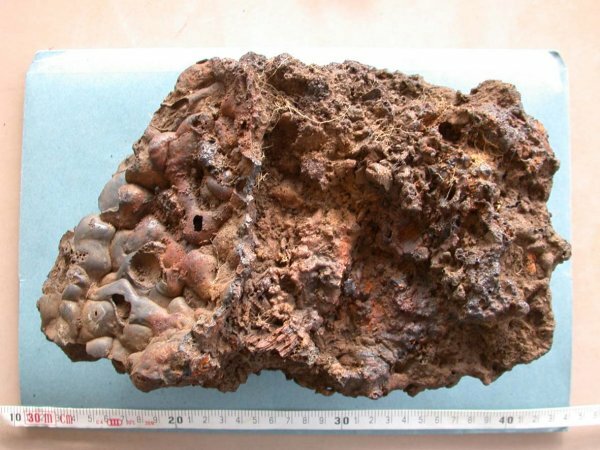 It was not possible to say weather the material was insitu, other than the presence of the furnace bowl, however the extracted charcoal returned a radiocarbon date 1st -2nd century AD Romano-British period. The first being Cal AD 220 to Cal AD 420 and the second deposit Cal AD 70 to 370. 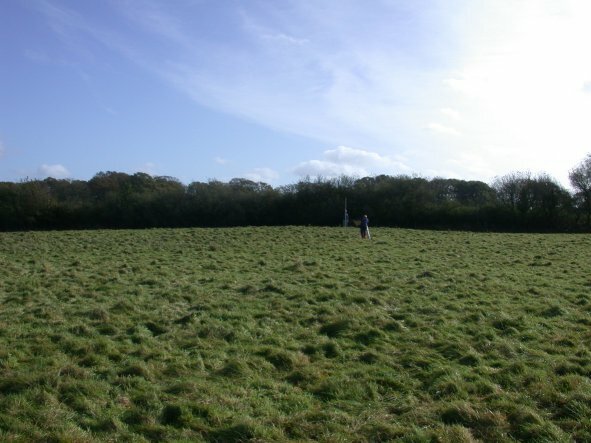 The Linhay and the slag mound are both situated in the field referred to in the Tithe Apportionments as ‘Serles Plot’. The Linhay is identified on the 19th century Tithe Map where it is coloured red; suggesting it was at that time an occupied dwelling. It is clear from the presence of slag in the building walls and the field boundaries that the creation of this small probable late 18th/early-19th century holding imposed upon the remains of the Romano-British iron- working site. Although this did not result in its’ complete demise it is not possible from such a quick investigation to determine the full extent of the destruction or reworking or conversion of this part of the site as a whole. 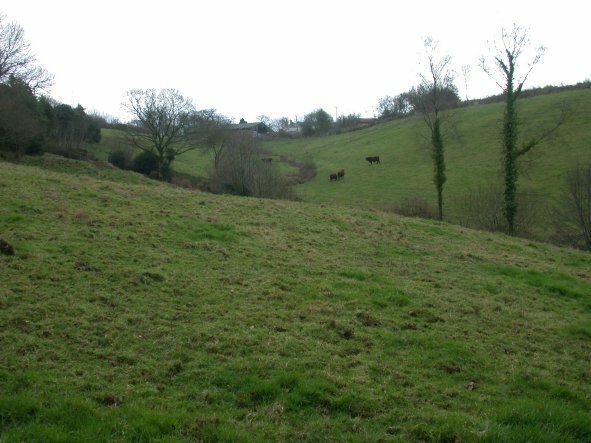 With regard to the quarry-like cutting the landowner has always understood this to be the site of sand extraction, taken over the centuries during construction phases of the Bywood farm buildings. Certainly probing of the waste mounds demonstrated they consisted only of sand. Furthermore the possible presence of a relic track leading back to the farm buildings may support this proposal, however it is also possible that iron-ore was also extracted from this side of the cleave and then carted around the deep cleave to the opposite side for working. Feature 4, dated to the Romano-British period, only covers an part of this small but industrialised site. The question is whether the other features suggest larger scale iron-workings or a site used over many years or many years of diversity in the use of the site. Table 1: Radio Carbon dates for Iron workings withinthe Blackdown Hills. Certainly there is a high degree of correlation with all the Romano-British dates falling in the 1st - 2nd century AD. In Griffith & Weddell 1996 it is noted that the period covered by the pottery also fits with the period of occupation of the legionary fortress at Exeter. They further suggest this is Roman military exploitation of the industry throughout the Blackdowns. The Bywood dates can be seen to lend further support to this theory. The Bywood pollen diagram suggests a period of woodland management that runs from the Late Iron Age onwards, although the scale of activity remains undetermined. The charcoal spikes in the pollen assemblage whilst not necessarily corresponding to land clearance phases do relate with known periods of iron-workings. These are the 1st-2nd century Romano-British and the later part of the Saxon period. Further charcoal spikes at about approximately 12th/early 14th centuries roughly match the date of the Feudal Aids (1148) which discuss two Welsh metal workers killing two other Welsh metal workers in Dunkeswell whilst in the employment of Dunkeswell Abbey. Finally, woodland management and increased charcoal production are perhaps encouraged by the bouts of increased iron-workings but during such periods who carried-out out the work, who controlled it and why? In the case of the later medieval period there are some clues. Charcoal workers, known as Carbonarii, are noted throughout the 13th (1222), 14th (1371) and 15th (1496) centuries on Dartmoor and are recorded in the Medieval account rolls for Dartmoor (Fox 1994, 164). It’s also possible to see that during the medieval period most likely it was the hired Welshmen who were actually carried out the Ironworking. Furthermore during this period it was most likely Dunkeswell Abbey controlled events and reacted to wider demand. During the Romano-British period however demand for iron may have been encouraged by the arrival of the Roman army, but who carried-out the work, managed the woodland, and created enough charcoal to meet demand remains unknown. This is also true for the Saxon period.